The mayor now consulted the military engineer and architect Colonel Sir Samuel Swinton Jacob about a suitable form for a memorial and he sketched out a chattri, a traditional Indian style of memorial with an umbrella shape symbolising protection, while recommending that “Mr. Henriques, a young native architect just completing his studies in England” should be requested to undertake the design. Henriques agreed and the design was complete and in Otter’s possession by December 1916. Otter had ceased to be mayor but he remained closely involved as chairman of the Indian Memorials Committee for Brighton. 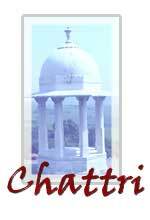 In August 1920 Sir John Otter was finally able to report that the Chattri was under construction. By the end of the year it had been built and it only remained to install protective fencing and the layout of the surrounding garden. The latter incorporated four miniature avenues of red and white thorn trees pointing north, south, west and east and the whole area laid with “true down turf which is the finest in the world.” The Chattri was unveiled by the Prince of Wales on 1st February 1921. From the outset it was quite clear that the Chattri was a Brighton Corporation initiative and that, while the India Office agreed to contribute half the cost of construction, all ongoing responsibility lay with the town. Initially some careful consideration was given to maintenance and a caretaker employed, but to the shame of the town the 1920s and 1930s were characterised by a series of complaints to the India Office from visitors and passers-by, complaints which the Town Clerks of the day generally tried to refute.